A high school playoff game always runs the gamut of emotions when it's over. The contrast in emotions was readily apparent following Manheim Central's 2-1 win at Susquehannock in nine innings in a PIAA District III Class AAA first round softball game on Tuesday afternoon. Tears were shed following the final out in the careers of the seven Susquehannock seniors. As a team that won YAIAA Division II, and went 15-5, they seemed poised for a deep run. 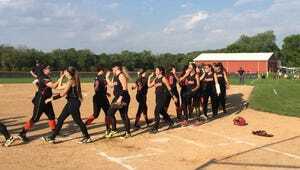 "The seniors are devastated," said Susquehannock head coach Jeff Deardorff said. "All of a sudden, they realize they are done. They weren't expecting to lose in the first round. A lot of them have played together since they were 8." Manheim Central's emotions were different. "It's very emotional to come to (another team's) home field and win," Manheim Central head coach Steve Ginder said. "This was our first winning season in three years. It was our goal just to get to districts, but once you get here, you certainly want to get a few wins." Manheim Central advances to play at No. 12-seeded Donegal in the second round on Thursday. Susquehannock starter Madison Staub had given up no runs on just two hits in the first eight innings. However, the Barons greeted her with some thunder in the ninth when Madison Walter led off with a solid single to left. "It's funny, when the leadoff batter gets a hot, everybody gets a hit," Walter said. Codi Bollinger ripped the next pitch to the base of the wall in left for a double, the first extra-base hit for either team in the game. Taylor Lauver hit a sacrifice fly, and LaChrishia Diffenderfer drove in the insurance run with a single to left. "(Madison) got two changeups up," Deardorff said. "One was hit to the fence, one to left." After a single by Alexys Blouch, Staub recovered to get a ground out and a comebacker to end the inning. Mallory Lebo reached on a bunt single and stole second in the bottom of the ninth. She scored Susquehannock's run on a two-out double by Staub that was misplayed in center field. Walter induced a foul pop-up to the catcher to end the game, however. The Warriors had a runner at third in the second with two outs, a runner at third with one out in the fourth, bases loaded with one out in the fifth, and a runner at third with one out in the sixth, but Walter put out the fire each time without any runs scoring. "We just couldn't get one more hit," Deardorff said. "That's the way it was all day." "I don't really think about (a runner being at third), because if I start thinking about it, I'm going to get stressed and tighten up," Walter said.